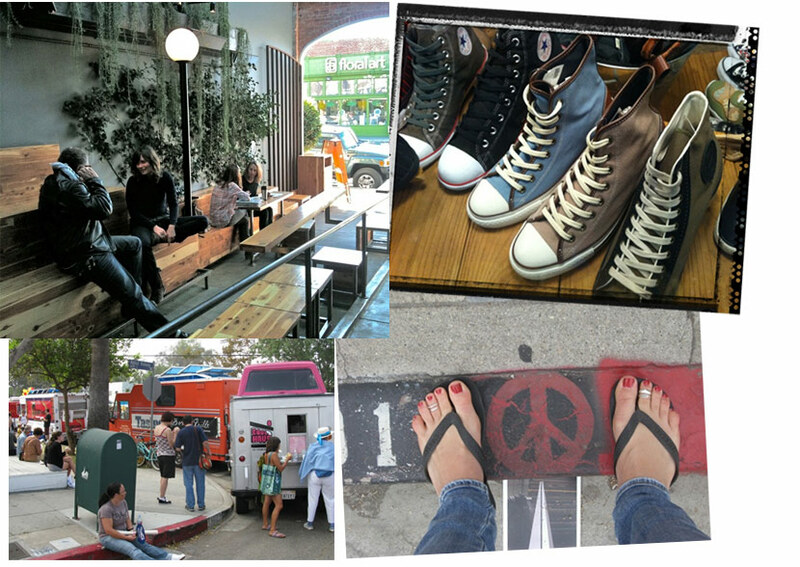 For my inaugural blog, I thought it would be fun to share with you some of my favorite things from the town I live and work in: Venice Beach, CA. An East Coast girl, I came to Venice 12 years ago and rented a townhouse near the beach. Before I signed the lease, the owner asked me to come check out the neighborhood at night to make sure I felt comfortable, a rather odd and ominous request! That night, I drove around a mostly desolate neighborhood with some homeless roaming the streets pushing old shopping carts. I signed the lease and my new landlord advised, “Never take a right turn out of the front gate. Only go left.” I took him at his word. During the first week in my new digs, a relaxing bath was interrupted by the sound of gunshots. I ran to the roof to see what was happening, and my boyfriend quickly pulled me inside. I’m sure he must have been wondering what this twinset-clad girl from Palm Beach was doing residing in the same neighborhood as Crips gang members. Twelve years have passed, and I love the Venice that was and the Venice that is today. The gunshots are now few and far between, and Abbot Kinney has gone from a two restaurant street to the hottest address in Los Angeles. Venice is still home to the homeless, artists, and now to multiple Marmol Radziner-designed homes. There is a woman that still pushes a stroller through our streets selling homemade tortillas and tamales, and the boardwalk is home to plenty of folks offering fresh cut mango, cucumber, and watermelon in a clear wrap. Yummy. The VENICE ART WALK http://theveniceartwalk.org has become a bit of a destination event over the past few years. For one weekend in May, local artists open their homes and studios to the public. With proceeds going to the Venice Family Clinic, you can take a walking tour of Venice’s best art and scope out some seriously cool Venice real estate in the process. Stroll along VENICE BEACH! and enjoy the newly-erected skate park, or dance on roller skates. Local vendors line the boardwalk with art, jewelry, and henna tattoos. Bike rentals are another fun option. I walk the beach all the way to Santa Monica and back each morning before the action starts. Venice is a casual beach town so no sky high heels needed! Havaianas, jeans, a cute top, and either a colorful cardi or hoodie will just about do it. It’s cooler here than most expect so don’t forget your sweater. I tend toward slim cargos and a tank top paired with a cashmere hoodie. I love Venice! Thank you so much for this piece. We love you!! You lucky girl! Living in Venice Beach!!! !I travel to Venice Beach several times a year and love it! When walking on the ocean front promenade I noticed that every bench has a colorful hand painted tile attached to the side, depicting a Venice Beach scene. Each bench tile is unique and beautiful like Stephanie Johnson’s travel bags. One Stephanie Johnson bag is not enough, all the different styles, patterns and colors make you into a SJ bag collector! The Jenny train case is the cosmetic travel bag of “my choice”. Thus, when I travel to Venice Beach, or Dhaka, Dubai, Rishikesh, Amsterdam for that matter…….Steph’s bag is in the suitcase. Oh, and btw the dosa’s from the dosa truck are tasty! Great blog! I, too, live in Venice and have been here for the past 5 years. I stay here for the cheap rent and the eclectic lifestyle. Though at times, I have questioned my residence because all too often there’s a stabbing death on the Venice Boardwalk, a gang related shooting, stabbing on the sands of Venice Beach and 100′s of other weekly crimes in the Venice community that need to be addressed by those that chose to call themselves “community leaders”. Fabulous blog! I don’t know anyone who has traveled more than you. When I get to travel, my assortment of SJ bags are always with me! Congrats!